Happy Thanksgiving everyone! 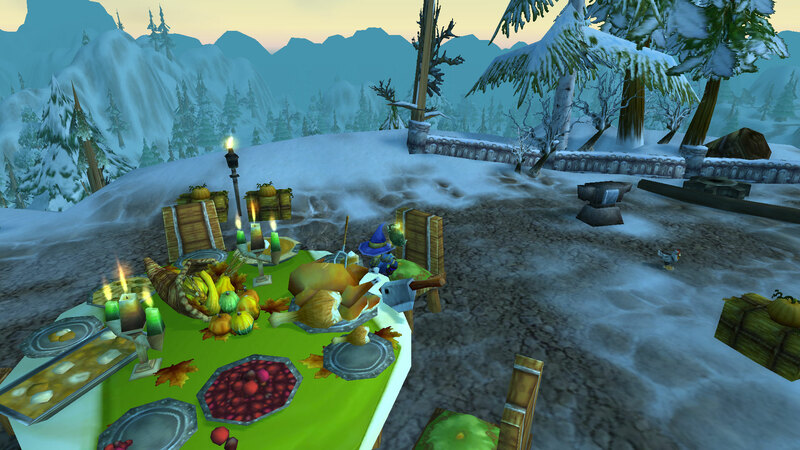 From both of us here at Growing Up in Azeroth, we wish you a delightful and safe Thanksgiving! Since the writing of this article, my home realm was announced as one of the future connections! Yay! So instead of a self-pitying complaint, you all now get a joyful celebration! Okay, maybe the title was a bit dramatic. But the notion still stands. My server, horde side is dead (Alliance side is actually lively, and quite nice). There are no auctions on the house, and when there is, those auctions are way overpriced. The Shrine is empty at peak hours and no one ever speaks in trade chat. I single handedly filled half of the auction houses listings one day without even trying. I think the alliance beats us 4 to 1 for players. Now, I don’t mind the lack of people, more so the lack of economy. In order to fully gem and enchant my character, I had to use the neutral auction house to get all the materials. There was NOTHING on the AH at the time. So, you can just guess how ecstatic I was to find out that my realm was slated for a future connection. I’m thankful for multiple reasons, in fact. First of all, BETTER ECONOMY! With the new hordies, there is bound to be more items on the AH. Supply and demand will work its magic, and hopefully the insane prices will go down. The second reason is new players. I know full well that the connection will not balance the horde to alliance ratio. At this point, all I care about is there being more horde players online. The server connection will bring us fresh blood, so to speak, and I can’t wait. The last reason is more guild options. On my realm, there is three guilds with a good amount of people. I’ve been in two of the three, and I can tell you that both are completely silent. Hopefully, the connection will either bring over lively guilds, put new life into our guilds, or create new guilds. Overall, I am stoked. In my opinion, this is one of the smartest and most exciting changes that Blizzard has proposed thus far. I cannot help but feel positive about the changes to come! 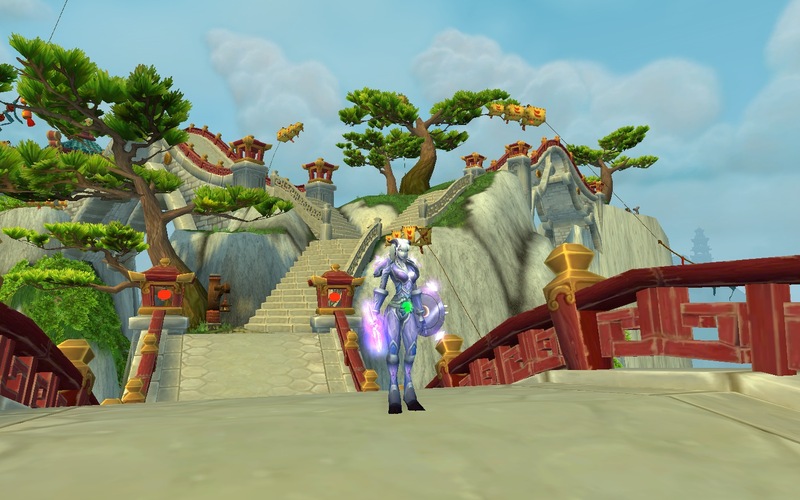 Well, I wanted to respond to Growing up in WoW for several days, and I have been thinking about how things have changed for my daughter and me over the years playing the game. Also, explaining the decision to let a older child play WoW is something I felt I ought to express. In the beginning, like most first time players, I had no clue how to play. Additionally, I didn’t know what would happen on the screen next. So, when I first started to play, our home setup was such that the available computer to play was in the basement. This was perfect. I didn’t want anything inappropriate or frightening to appear if I had an audience when playing. I even remember waiting until after bedtime before logging in, just in case. So I had played for several months before Fussypants even knew about the game. Eventually, she saw me play and, as you know, she was very, very interested. She started to ask if she could watch, which was fine at the time. Then, she asked to sit on my lap and “help” me. She would run around and jump, and jump some more. Many months later I had seen and learned enough about WoW that I knew that Fussypants could play, as long as I watched her and hid chat. Honestly, I had a great time watching her figure it out. A few years later our family moved up to two computers and I was able to play with her and it only got better. Now we have raided, quested, dueled, explored, and battlegrounded together. We’ve shared achievements and argued (a lot) on what to do next. Now, she has become the primary player and I watch her play. And then, this blog was born. Yes, I’ve been playing WoW since I was a kid. And before you start making assumption about how bad it is that a child is allowed to play WoW, let me explain my experience. I remember my dad getting the game after a family friend told him about it. Being naturally curious, I always watched him play. This was the first true video game to enter my house, and it was amazing. It was fascinating to me, like a movie that he could control. So, of course, I wanted to try. I entered the world as a draenei hunter, named Eightandgreat. I spent the first few play times just running around, looking at everything. At that point, I had no idea about end game, no idea about leveling, no idea about combat. Heck, I didn’t even realize that the other characters I saw were other people. Eventually, I figured out how to actually fight things. My dad was always there, but he let me explore and didn’t tell me how to do anything. I leveled slowly, fishing as much as I played for reals (sorry, but fishing is not really playing). Over time, I began to master how to play the game. I didn’t like hunters (at the time they were hard to play) so I tried paladin, rogue, and finally mage. I leveled almost exclusively through questing, and only did a battleground when I was feeling especially bold. This exploration, without the pressure of the social side, is the way I think that kids should start out with WoW. My dad didn’t even let me look at chat for years, which helped to shield me from that nastiness. I was just wandering through the world and having fun. I can understand why some adults don’t let their kids play WoW. But I think, that if your child is curious, letting them explore the WoW world is actually a good thing. I have been playing for about six years now, starting when I was a kid. And I can safely say, that I truly grew up in Azeroth. The game has really shaped who I am, and I wouldn’t want it any differently. This article was written entirely by Fussypants. Over at WoW Insider, they have a column called Community Blog Topic, which is a chance for the opinions of other blogs to be gathered and published on their site. 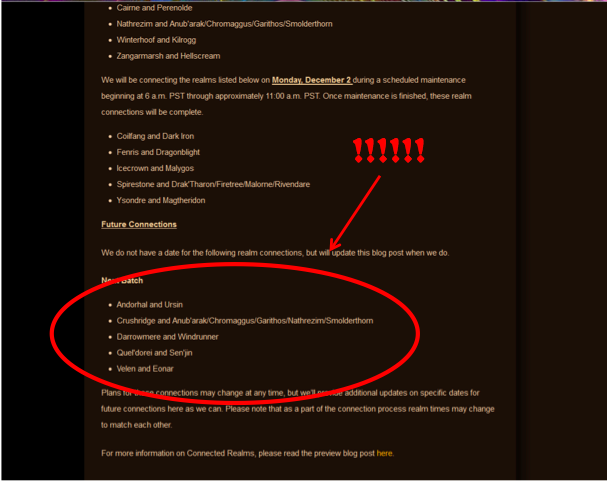 This week, the question they asked was “What is your favorite announcement for Warlords of Draenor”? Both Yotaan and Fussypants blogged their answers here! Fussypants: There are so many to choose from! However, overall, I think one that got me most excited was new character models. The ones they showed at BlizzCon were amazing, and I can’t wait for more. I was worried about how they would look, but one glimpse at that adorable gnome was more than enough to quell my fears. I could totally see my gnome mage rocking that new model. The new models are, in my opinion, one of the more important announcement. Think about it. You stare at your character every time you log in. In my mind, looking at a significantly better character is more important that a toy box tab. You use your character every time you play. On the other hand, my favorite quality of life announcement would have to be the mat stack size increase. The boost to one hundred per stack for mats is a dream come true. On my tailor character, I have over thirteen stacks of mageweave, and with that change, I could have as little as three. The stack size change (if it stays till live) will be one of those changes I’m grateful of for a long time. For me, my favorite announcement is the change of the stats. I never liked hit. It was annoying to fiddle with gems, reforging, and enchants to keep hit at a certain level. Hit was not fun, just a task. I suspect I would feel the same about expertise, dodge, and parry. Reforging, for me, was interesting when I tried to max out a stat and see what happens. For my shaman, I liked trying to max out mastery, which duplicated my spell for 75% damage and no threat. What it really did was make my shammy a nonstop chain lightning fiend! I don’t think I will miss reforging, since that will be gone too. I am, very much, looking forward to new interesting stats. One mentioned was speed, which I take to be run speed. That could be interesting and getting around faster will help in PVP and PVE. The other was cleave, which could go either way. It is supposed to provide cleave damage occasionally. Sounds cool, but I worry that I will cleave when I’m supposed to be single targeting only. I bet there may be other stats too, so I am very excited to see what happens! Two days ago, the new World of Warcraft expansion was revealed officially at BlizzCon. It is called, “The Warlords of Draenor”. Fussypants: I love it! I love it, love it, love it! My favorite part of WoW lore is the draenei and orc history. I think it’s spectacular that the players can now partake in one of the pivitol parts of WoW lore. The BlizzCon video was impressive, and the new models and areas were beautiful. My only drawback is the time travel aspect. I don’t like that we go back in time to Draenor and effectively retconn much of the lore. However, I can’t think of any other way that Blizzard could have done it. The expansion looks promising! Yotaan: So, far, I’m excited for this new expansion. My favorite part of playing is exploring and it looks like there will be a lot of that. I also really enjoy the lore and I think the new way the story will play out (via the Map) is promising. Fussypants: Of all the newest features, I’m most excited by the new character models. The ones that have been revealed are quite nice looking, and I can’t wait for the female counterparts to be revealed (as I only play female characters). The level cap increase was expected, but still nice that it is 10 levels instead of 5. The two new features that I’m not so sure about are the garrison and the one character level boost. For the garrison, it sounds like a lot of micromanaging and work that I won’t necessarily want to do. And for the level 90 boost, I don’t know who I could use it on. I’m slightly worried that I would use it on a character, and then find out that I didn’t like that class. Both features may turn into one of those things I never use. Yotaan: I think the level 90 boost is very interesting. Potentially, I can have a max level character on both Alliance and Horde, and I will get the story from both sides. I am not so sure about the garrison part, I hope it is fun and does not involve a lot of managing. That being said, I am using my farm all the time, so I bet I will like the garrison. I do wish there was a new race or class, this is the first expansion without one of those. Overall, we are both stoked about the new expansion. There are many promising new features and quality of life upgrades to come. Welcome to Growing up in Azeroth! Hello everyone! Fussypants and Yotaan are teaming up to bring you a father/daughter view on all things World of Warcraft. This blog will (hopefully) be a collection of thoughts, opinions, rants, and discussion on WoW. But who are these mysterious Fussypants and Yotaan? Fussypants: Hello all, I am the daughter portion of Growing up in Azeroth! I hope to use this blog to further my writing, as well as express my views on WoW. Before we start, here’s a bit about me. I play a holy paladin, a frost mage, and a holy/shadow priest. Normally I play Alliance, but I have maximum level characters on both sides. I have been playing since the Burning Crusade but not seriously until Wrath. This is bound to get out eventually, so I may as well say it now. I am a teenager. A girl teenager. Who plays WoW. Yup, such a beast exists. Yotaan: Hi, I’m the father part of this adventure! I wanted to start this blog with Fussy because of her enthusiasm; we have fun together in the game and out of the game. I play an ele shaman, destro lock, and windwalker monk. I, too, have been playing since BC, but a little more than my daughter. I was Horde until Fussy convinced me to change factions. Our goal is to post at least once a week. We hope that you enjoy the blog!